Cooking can be experimental sometimes, particularly if you are able to make dishes without using a recipe or measuring every ingredient out. Adding this or that in different quantities can have a dramatic effect on the taste, look or even the consistency of any dish you’re preparing. Some of us are afraid to use herbs and spices for fear of overpowering the flavour, but if used appropriately they can enhance even the most basic dish. Indeed, they can transform a flavourless dish to one that is mouthwatering! Herbs and spices should only be used to enhance the natural flavour of food – they are not intended to conceal or mask it so the advice is to be selective in whatever spice and herb combinations you choose and avoid overusing it in a dish. Herbs are plants that don’t have a woody stem and die at the end of each growing season. For example, parsley, basil, dill or oregano. They can be fresh or dried – dried herbs are more concentrated but fresh herbs are a great source of concentrated antioxidants, vitamins and minerals. Spices are usually from the aromatic part of a plant found in the tropics – it could be its bark, seeds, buds, root, berry or even the fruit itself. 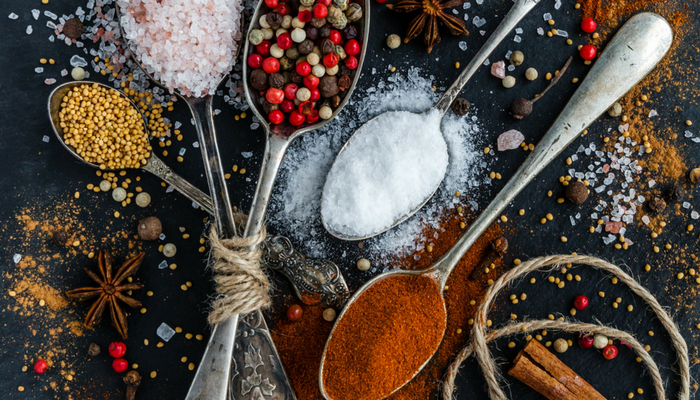 There are some fantastic combinations of herbs and spices that go with particular foods but there’s no harm in experimenting with others – it all depends on your palate! We would advise to only put basil, parsley, dill and mint into a dish towards the end of cooking because extended exposure to heat causes them to lose their flavour. Also, herbs and ground spices should be kept for about a year in airtight containers preferable in a dark place. Whole spices like nutmeg can be kept for 2 years. The key thing for all of them though is avoid it coming into contact with moisture or heat. Here at the Gascony Cookery School, most of our courses feature a trip to Fleurance’s local market where you will be able to familiarise you with fresh regional products including some herbs and spices. We are always keen to welcome new students. We can offer you a wealth of information, hands on experience and exposure to the culture and climate of beautiful Gascony. If you’ve previously enjoyed joining us on a course, we’d love to see you again too so you can once again partake of our Gascon hospitality. To view the details of this season’s courses and their dates click here.